The Storm Glass has been used since around 1750 as a way for sailing ships to predict the arrival of stormy weather. It was well documented that Captain Fitzroy used one aboard the Beagle when he sailed around the world from 1831 - 1836 with the young Charles Darwin aboard. Fitzroy was very knowledgeable about the weather, and later became the director of the British Meteorological Office. Some people use the Storm Glass to predict the weather 24-48 hours in advance. Some apparently use it to tell them when the fish will be biting! No-one is certain exactly how the Storm Glass works, although Captain Fitzroy thought it was something to do with static electricity in the air. The Storm Glass should be placed in a cool place, either in a north facing window or on a boat. Depending on the appearance of the crystals inside the Storm Glass, predictions can be made about the forthcoming weather. When the crystals are growing, the weather will be cold and stormy. When the crystals are disappearing, the weather will be warmer. Star-like crystals falling in the water means frost, and a clear liquid means it will be fine and dry.The glass vessel contains a mixture of water and ethanol, some salts and also camphor - it is crystals of camphor that appear in the Storm Glass. 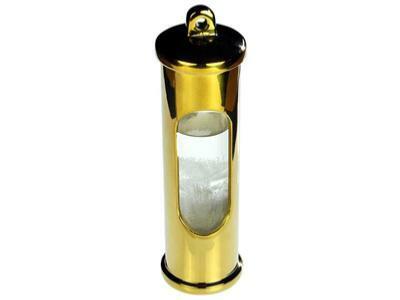 The glass vessel is enclosed in a polished brass enclosure. It should be kept away from strong heat or direct sunlight. It comes in a smart black cardboard presentation tube. Finished in brass, it comes complete with a holder, allowing it to be wall hung. Instructions in six different languages are included. Made in Denmark. 145mm high. Very well made and unusual product.I bought it for my weather fanatic partner and she loves it!